Last fall, ABC News president David Westin told an interviewer he planned to stay in his job until the network's key shows -- World News Tonight, Good Morning America and This Week -- were winning their respective ratings races. "[U]nless we get to be No. 1, my work won't be done," Westin said. Times change. While ABC is still very much No. 2, Westin has decided his work is, in fact, done -- or someone has decided it for him. "I've always admired those few who know when it's time to move on," the 58-year-old executive told his employees in a memo. "This is the right time for me." Westin's exit comes at a moment of relative calm for the network. 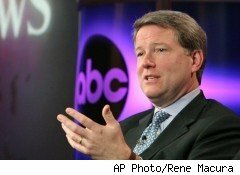 In the past year, he has overseen successions at each of those three critical programs, installing Diane Sawyer in place of the retiring Charles Gibson at World News Tonight, George Stephanopoulos in place of Sawyer at GMA and Christiane Amanpour, hired away from CNN, in place of Stephanopoulos at ThisWeek. He has also engineered a radical downsizing of the entire division. In February, ABC News announced plans to cut between 300 to 400 employees, the latter figure representing about 25% of the total headcount. In making this cutback, according to both published accounts and insiders' talk, Westin was going along with a mandate from his bosses, ABC Television head Anne Sweeney and Disney (DIS) Chairman Robert Iger, to increase his division's profit margin from its current slim level of around 5%. While Westin strove gamely to achieve that increase, he always made it clear that prestige, not profit, was what he prized. "To his credit, he tried to keep the level of journalism really high," says one former high-level ABC News executive. "He loves the pureness of journalism, the philosophy and theology of it." That could be why he elected to hire the highly regarded Amanpour, whose expertise is in international affairs, traditionally an area of low interest for viewers, rather than a Beltway insider to helm This Week. It could also be why he never aggressively pursued a deal like the one that CBS is said to be seeking with CNN, which would allow ABC to further shed costs by outsourcing much of its newsgathering. Westin said his 14-year term as president will conclude at the end of the year.